Samsung have revealed their plans to launch their Android based tablet, the Galaxy Tab in the United Kingdom. The 7-inch tablet will be available on a number of electronic goods retailers and via all major British carriers like Carphone Warehouse, Dixons Store Group and T-Mobile. 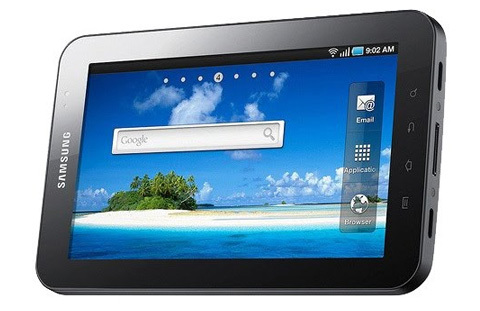 The Galaxy Tab will run Android 2.2 or Froyo and will be powered by a Cortex A8 1 GHz processor. It has 512 MB of RAM and 16/32 GB of internal memory, which can be further upgraded with microSD memory cards. The Tablet also sports a TFT-LCD display with 1024×600 pixel resolution, a 3-megapixel camera and an additional front 1.3-megapixel camera for video chats. With BlackBerry announcing their new tablet called the PlayBook and Apple rumoured to be building a mystery multi purpose tablet which could be the new iPad, the tablet market just got a lot more competitive. It is yet to be seen whether consumers buy the Samsung tablet or decide to wait for the next generation iPad or the first generation PlayBook.